February 4, 2019 Garland, Texas – Terry was born in May of 1955. When he was about 6 to 7 years old in the early 1960s, he had been traumatized by what he called “monkeys” that came in his room at night periodically and asked him to go play. Sometimes he went. Other times he was so afraid he would go screaming to his parents. For many parents, the child’s trauma is dismissed as nightmares, without giving consideration to the possibility there could be Something actually entering the child’s room. But for Terry, there was one entity that always seemed to be with the monkeys and seemed friendly to him. It was a female who wore a wig apparently to look more human and seemed motherly to him. 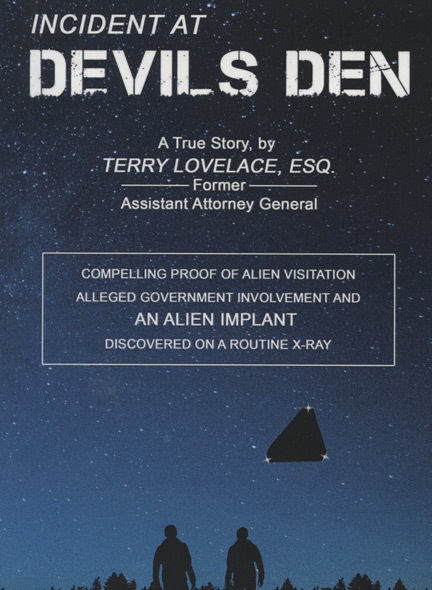 Then there was the abduction when he was 22 years old in Devil’s Den State Park in June 1977. Incredibly, Terry forgot everything until the night of October 22, 2013, when he was looking at the anomalies in the x-ray of his right leg after his leg gave out and he ended up in the V. A. Medical Center radiology lab in Dallas, Texas. Like magic, that night he began to remember everything from the high strangeness abduction 36 years before on the camping trip with his good USAF friend Toby at Devil’s Den park in northwestern Arkansas. And that’s when Terry started thinking about writing a book and was talking to people about the anomalies in his right leg on his x-rays. 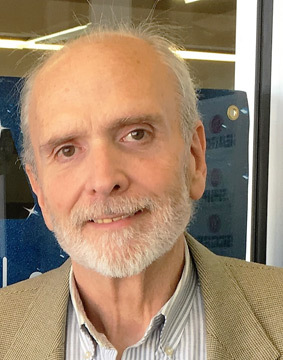 The more he researched, the more determined he became to write a book and started reaching out to other people — something he had never done during his younger life. Terry Lovelace: “I wake up in the middle of my living room around 3 o’clock in the morning. I am sitting upright in my chair, and I woke up with my eyes wide open. And seated across from me is what I first thought to be a petite Asian woman. And I’m thinking this woman had the ability to read my mind. She communicated telepathically. And I was wondering, am I going to say something that’s inappropriate? Am I going to say something to make her angry, God forbid? TERRY, WHAT WERE YOU HEARING IN YOUR HEAD AS TELEPATHIC COMMUNICATION FROM HER? The first thing I thought was, “My God, that wig looks ridiculous,” because it did. It was on her head askew. I know that sounds crazy, but that was the first thing that crossed my mind. IS IT THE SOUND OF A FEMALE VOICE IN YOUR HEAD WHERE YOU’RE NORMALLY ACCUSTOMED TO JUST YOUR MALE THOUGHTS? OR WHAT IS IT THAT YOU ARE GETTING AS THE EXPERIENCE OF TELEPATHIC THOUGHT? What I received was a female voice as audible and as clear as any spoken word you’ve ever heard. But it wasn’t through my ears. It was in my head. And there was no accent of any kind. It was just her words. And she spoke very plainly, and I understood her, and I remember thinking, and when I say think, I mean say. They’re interchangeable. Anything you think, you might as well say. And she dodged the question twice and wouldn’t tell me. She just said they served many purposes. She told me that she was a hybrid being and that she worked for her Host, who I refer to as alien. And the thought was, “My God, I wish she’d take those glasses off.” Then she took her glasses off, and I could see her full face. And I recognized her immediately. I knew who she was. She was the lady that I referred to as Sue when I was a little boy. She used to take me along with some other kids. It was always the same group of kids, when I was age six and seven about the time I saw the UFO. And they would come and ask me, “Would you want to come with us and play?” And it was weird. They were made up as little circus monkeys. And I’m sure that they portrayed themselves in that way to be benign to a six or seven-year-old child and not be frightening. WHY WOULD YOU BE RECOGNIZING THIS FEMALE IN 2017 IF SHE GOES ALL THE WAY BACK TO WHEN YOU WERE SIX- OR SEVEN-YEARS OLD AND YOU THOUGHT MONKEYS WERE COMING INTO YOUR BEDROOM? WHAT WOULD HAVE BEEN A CONNECTION TO YOU ABOUT THIS FEMALE SITTING ACROSS FROM YOU WEARING GLASSES THAT YOU WANT HER TO TAKE OFF AND THE MONKEYS? The monkeys were the abductors. The monkeys I have nothing but malice towards. I would shoot the monkeys if they came back. But I felt genuine affection for this woman. TERRY, ARE YOU TRYING TO SAY THAT THE MONKEYS, WHEN THEY CAME INTO YOUR BEDROOM WHEN YOU WERE SIX- OR SEVEN-YEARS OLD, THAT THEY WOULD END UP TAKING YOU TO A CRAFT WHERE THIS FEMALE WHO IS NOW TALKING TO YOU IN 2017 WOULD BE WHEN YOU WERE A CHILD? Precisely. Exactly the same woman, yes. WHAT DID SHE DO WITH YOU WHEN YOU WERE SIX- AND SEVEN-YEARS OLD? We went to like a play area that I remember being circular and having a grey padded floor. The room was well-lit, but I can’t identify exactly where the light is coming from. And she was always there. She would play games with us, usually involving symbols. Geometric triangles, circles. AS YOU TALK NOW ABOUT BEING TAKEN AS A CHILD (IN 1961-1962) — WE ASSUME INTO A UFO CRAFT — THAT THIS ASIAN FEMALE WHO IS SITTING ACROSS FROM YOU IN SEPTEMBER 2017 (TERRY AGE 62) WAS ALWAYS WITH YOU AS A CHILD AND PLAYED GAMES WITH YOU HAVING TO DO WITH SYMBOLS AND PATTERNS? Yes. And I think it was intentional that she allowed me to remember that. Had she not allowed me to remember that, I would not have known. I think for whatever reason, she wanted me to have that memory. 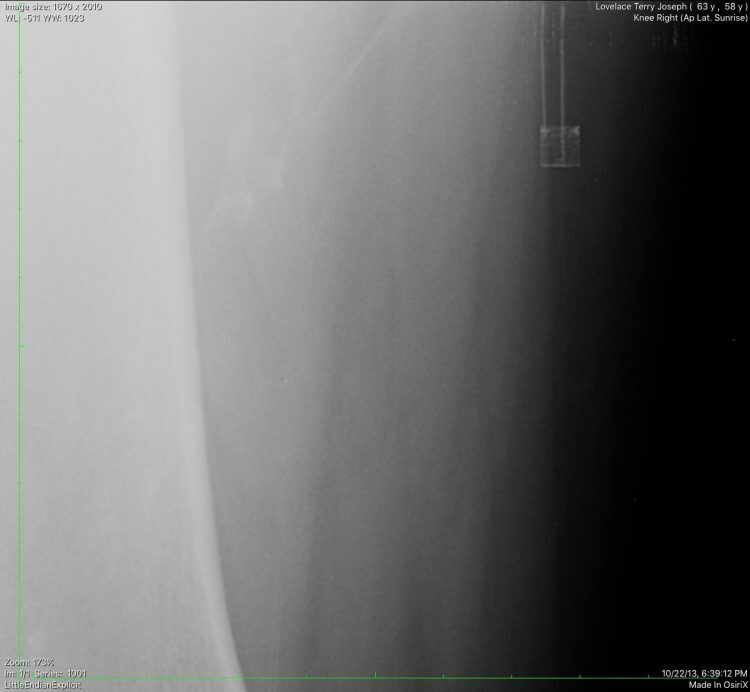 Terry Lovelace x-ray of unidentified metal implant in subcutaneous tissue of his thigh above right knee. The metadata shows the date was October 22, 2013, at 6:39:12 pm, which was Central time at the Veteran’s Administration Medical Center Radiology Lab in Dallas, Texas. Terry and his wife, Sheila, live in Garland, a suburb of Dallas. Click image to enlarge. LET’S GO TO WHAT SHE COMMUNICATES ABOUT YOUR RIGHT LEG AND THE X-RAYS. And that’s when it hit me, I never had my left leg x-rayed (specifically to look for implants after anomalous metal square found October 22, 2013, ), but she said that I had devices—she referred to them as devices—in both legs. And she said, “Because people will believe you.” There’s nothing that makes me anything special. I don’t understand it, but that was her answer to me. YOU WOULD BE BELIEVED PROBABLY BECAUSE YOU HAVE A MILITARY BACKGROUND, AN ATTORNEY BACKGROUND, YOU’RE INTELLIGENT, AND FOR A WHILE, YOU WOULD HAVE HAD TOBY TO BACK YOU UP. IN YOUR BOOK, YOU TALK ABOUT WHAT IS BASICALLY A VEILED THREAT FROM HER. CAN YOU EXPLAIN THAT NOW? It was not the least bit veiled. There were two what I interpreted as threats. The female alien threatened first that the thing above my knee (and in left leg Terry knew nothing about) can’t be removed and analyzed by terrestrial scientists. She said her “Host” will not allow that to happen. THAT CAME OUT OF HER MIND TO YOUR MIND? Correct. It was all mental, telepathic. WHEN SHE SAID, “IF YOU DO TALK AND DO YOUR BOOK, YOUR GOVERNMENT WILL KILL YOU,” DID YOU THEN MENTALLY ASK HER WHY WOULD MY GOVERNMENT KILL ME BECAUSE I HAVE YOUR (alien) IMPLANTS IN MY LEGS? That was pretty much toward the end of the session because after she said that, I was in shock, I guess. I was numb. I think that was pretty much when things wrapped up. What Is The “Host” and Why Is It Abducting and Implanting Earth Humans? ALL RIGHT. THAT WAS SEPTEMBER 2017. WE ARE TALKING IN JANUARY OF 2019. IN THIS PERIOD OF TIME SINCE THIS FEMALE ALIEN SAT ACROSS FROM YOU AND TELEPATHICALLY COMMUNICATED, AND YOU RECOGNIZED THAT SHE HAD BEEN IN YOUR LIFE SINCE YOU WERE SIX- OR SEVEN-YEARS OLD, DID YOU HAVE ANY VIVID DREAM OR ANY OTHER EVENT HAPPEN BETWEEN 2017 AND TODAY IN JANUARY OF 2019 THAT WOULD EXPLAIN WHO THE HOST IS, WHY IS THE HOST INTERACTING WITH EARTH, WHAT IS THE EXPERIMENTATION ON HUMANS, WHY DID THEY PUT THE IMPLANTS IN YOUR RIGHT LEG, AND SHE SAYS ALSO IN YOUR LEFT LEG? WHAT IS THE BIG PICTURE IF SHE ALSO IS A NON-HUMAN WARNING YOU THAT THE UNITED STATES GOVERNMENT WOULD KILL YOU IF YOU TALKED ABOUT THESE IMPLANTS IN YOUR LEG? Those are huge questions, and the answers are as follows: the female alien warned me that the implants in my right and left leg would be removed if I continued to talk. And my wife and I discussed this, and the threat that the government would kill me, and I made the decision that I’m going to continue to talk, and I’m going to speak as loud as I can to as many people as I can because it’s the truth, and I want people to know. And I think people have the right to know. And about three weeks after she came, I woke up at 7 AM with horrendous pain in both of my legs. They came and took the devices out of my legs, and I woke up, and I told my wife, “They came, and they took their implants back.” It gave me a feeling of urgency that there are things that are going to happen and things that are happening now that are not under our control and that only very few people know about. And she said, “There are people that know everything. They’re not going to tell the people.” She showed me a lifeboat on the Titanic. And she said, “A beehive example.” These thoughts didn’t come from me. I didn’t sit down and make these up. These thoughts were planted in my head. She showed me what happens when a hive gets too big. The queen and a bunch of the workers, they leave, and they go somewhere else. And she said, “Yes, that’s right. That’s exactly right.” She said, “We have people on the far side of the moon,” that they’ve been there for over two generations, that there are people there that were born there that have never been to Earth. There is a propulsion system that allows them to travel from the moon to Mars in 17 hours. And I scoffed, and I said, “That’s ridiculous. That can’t be done.” And she said, “Yes, it is. Yes, it can be done. It’s done every day.” She said just as our Navy has aircraft carriers with aircraft, we have aircraft carriers in the sky that are docked on the moon that transit between the far side of the moon and Earth and back. And she said what’s going on right now is a frantic effort to build, trying to prepare things. The urgency is growing. TERRY, BUILD WHAT FOR WHAT? Build housing to build a civilization. On Mars. They had the first on the moon. Evidently, there’s helium 3 on the moon that gives them a cold source of nuclear power. “I think we humans have a soul, and they don’t. And by God, they want one!” – Terry Lovelace, Esq. Linda Moulton Howe: In my third book Glimpses of Other Realities, Vol. II: High Strangeness, people in the human abduction syndrome also talk about the huge importance that the human soul plays in non-human interactions with us. Some abductees for decades have said that some alien intelligences study the moment of death for human beings in an effort to find out which dimensions Earth Homo sapiens sapiens enter after the moment of death — dimensions that the non-humans cannot enter. Humans with souls and free will might be a rare life form in this universe. Human free will choices in conscious life on Earth might add up to specific soul frequencies that resonate with only specific other dimensions. You reap what you sow, whether human, ET or angel. 03-29-2013 – Part 1: 12,000-Year-Old Gobekli Tepe – Is It Linked to the Star Deneb in the Cygnus Constellation? 03-29-2013 – Part 2: 12,000-Year-Old Gobekli Tepe – Was It A Soul Recycling Machine Linked to Deneb in the Cygnus Constellation?